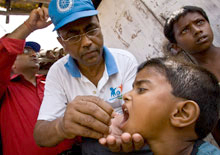 The Rotary Foundation is an international trust whose trustees are Rotarians. Our Foundation is Rotary in action as an international humanitarian and educational charity.The Rotary Foundation is Rotary's own charity. Our purpose is to do good in the world. Our mission is to advance world understanding, goodwill and peace through the support of education, the improvement of health and the alleviation of poverty. You can read or download a copy of the Foundation's Annual Report for 2017-18 by clicking on this link. Rotary International is a worldwide organisation with 32,000 clubs in almost every country of the world. We are committed to service for communities throughout the world. Many Rotarians have vocational skills that they use to support humanitarian and educational projects that help to make their communities better places. The Rotary Foundation harnesses the potential of this worldwide organisation by helping clubs to undertake humanitarian and educational work. To deliver sustainable educational and humanitarian projects through grants to Rotary Clubs all over the world. Click on the Humanitarian Projects link on the right to read about some of the projects run by Rotary Clubs in District 1010: Scotland North. To foster world understanding, goodwill and peace through the Rotary Peace Centres. Click here to find out more about the Peace Centres. Foundation grants can also support Scholarships and Vocational Training Teams. Click on the links on the right to find out more. Our charity, like all charities, depends on donations. If you would like to help us by donating, by helping to fund one of our projects, or by buying one of our fund raising products, please have a look at our donating page. Contact the District Rotary Foundation Chair, Carol Stewart, on the link below for more information. Peace is a core part of the mission of The Rotary Foundation and one of the Areas of Focus for the Foundation grants. The Rotary Foundation, Rotary's own charity, was founded in 1917. This page gives a summary of the first 100 years of Doing Good in the World.